Faro is the capital of the Algarve en is located on the most southern point of Portugal. Faro is the name for the council but also for the city. The city of Faro is the administrative centre of the Algarve region with a population exceeding 40.000 people and covers an area of around 202 Km2. It is divided in six civil parishes; Conceição, Santa Barbara de Nexe, Estoi, Montenengro, Sao Pedro and Sé. The city has both Roman and Arab ruins, the old part of Faro, still surrounded by Roman walls, is attracting tourists from all over the area. You can still see the open square that once used to be the Roman Forum. Interesting buildings are the 13th Century Cathedral, the Episcopal palace and the 16th Century Convent, now turned into an archaeological museum. The church of Nosso Senhora do Carmo is an excellent example of gold-leaf woodwork and contains a chapel lined with the bones of more than 1.200 monks. Faro also has beautiful beaches but with a different character. Most beaches you can reach by boat as they are located on a peninsula (biland).Faro is surrounded by the Ria Formosa which is a unique coastal lagoon that is continually changing due to tidal changes, winds and currents. It is home to a number of diverse habitats such as barrier islands, marshes, tidal flats islets, dunes, salt pans, fresh water lagoons and as such is one of the most important areas for aquatic birds in Portugal. The Ria Formosa lagoon is a Natural Park with total area of 170 m² but it also plays an important role in the region's economy. Beyond the touristic use the system also supports economic activities like seafood farsm and the port of Faro. Faro has also one of the largest and most modern Shopping Centers in the Algarve. The Shopping Center is built with so many open air that in the hot summer months you can still shop enjoyable. There is also a major supermarket in the summer evenings which is open until 24:00! 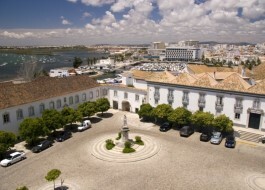 Faro has a beautifull, traditional city centre, a sea port and a marina. Around the port of Faro there are different seating areas which are popular among the Portuguese, who enjoy their "Bica" (espresso) during the day or there glass of wine in the evening. 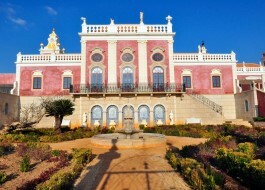 In Faro there is also a cultural centre where many performances and pop concerts are given. There is also a large hospital, a public university, railway station and a newly built football stadium that attracts many visitors as Benfica or other well known soccer teams are playing their match. Faro airport is located 4 kilometer from Faro city.